I finally got around to lighting Nemo. 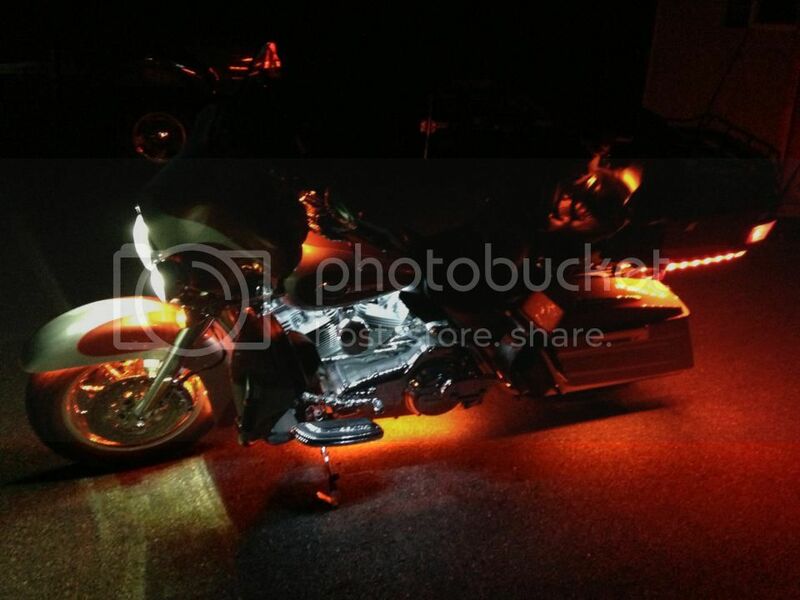 I received the lights as an early birthday present so I could light the bike before we went to Delmarva bike week. This has been on my wish list since 2007 when I bought the bike. I went with a two tone lighting scheme, using orange for ground effects, dash and accents and white for the engine. I haven't seen too many done this way. I ran three separate circuits. I put the white engine lights on a remote control unit so I can set it to the breathing effect or solid white. The ground effects and tourpak accents are on a switch I installed in the left heat deflector (between the pipe and seat), and the front wheel and fairing are on a second switch. 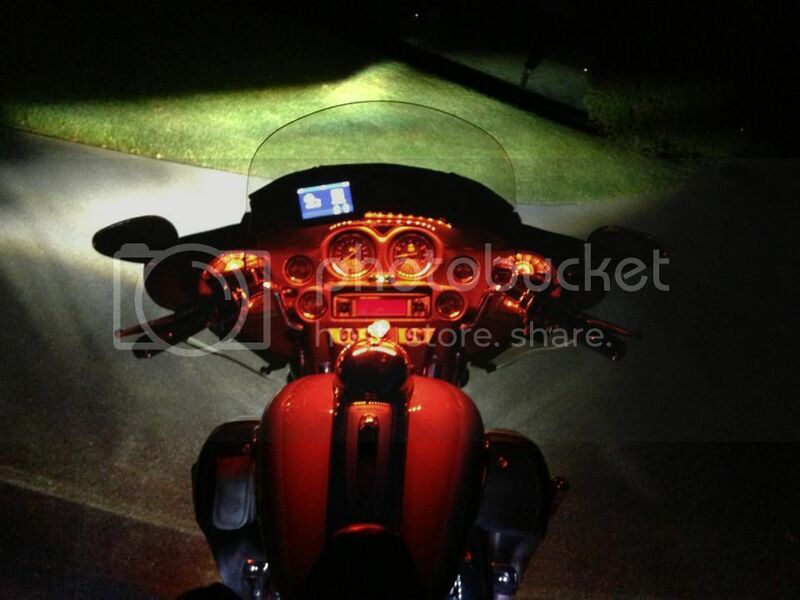 I did it this way so I can run turn off the lights in front while riding. In PA they won't screw with you in most cases if you only light the engine, ground and back. I kept all the orange lights off of remotes because I eventually will either by or build a music interface so the lights can flash with the music. I will add a switch at that point to select between the music power source and a solid power source. Some people like engines... I like lights and sound. Eventually, when I get my next bike I will add a lot of sound to this. with saddle bag speakers and woofers, fairing lower speakers and additional amps. But that won't be until I have another bike for regular touring. JC, we've talked about it before. I like how that looks. It beats the flashing headlights or burn your retina LEDs that the gold wings have. Nice job! Thanks Jim. We can do most of the same items to yours. I'll have the camper as a guest house in late September so feel free to make a fall foliage ride and come on down and we'll put them on the Jester. The speaker lights require aftermarket speakers that have a spacer. The J&M 7.25 inch Rokker's have it and I think the new Boom Audio's might have them also. The other unusual place I put them is on the windshield bag. Mine hangs over the dash pad just enough to light the tank and fairing nicely. But it basically means I have to leave it on all the time. Which I already had to do because I have the GPS mounted to the bag anyway. One other location that would've added a nice touch is on the inside of saddlebag guard. 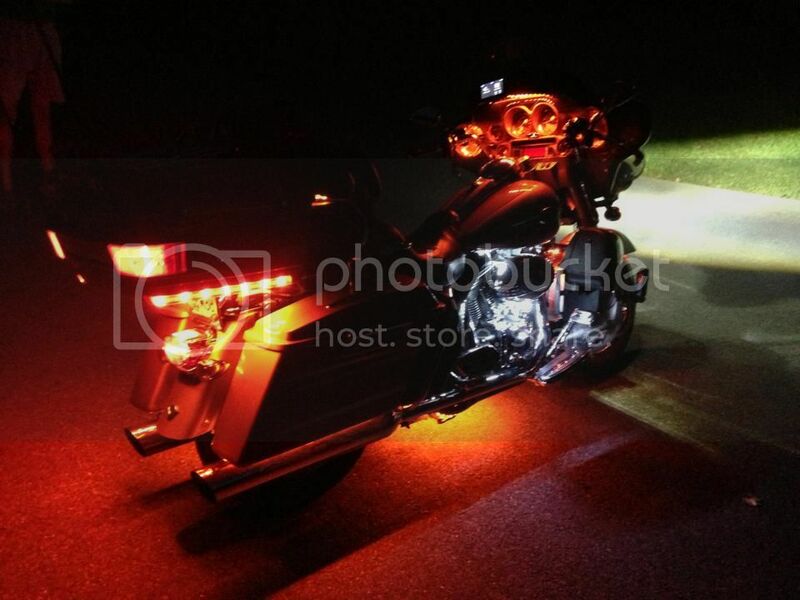 It lights up the side case and a bit of the saddlebag. I have bags on mine so no go for that location for me. But I've seen them at Gettysburg and they're cool there. Also, I've seen someone add a different trim ring to the headlight and tuck lights into the ring. Not like the prebuilt white ones from Kury, but actually adding them to an HD P&A piece. I'm still investigating that one. I got my lights from Monsterbriteleds.com.